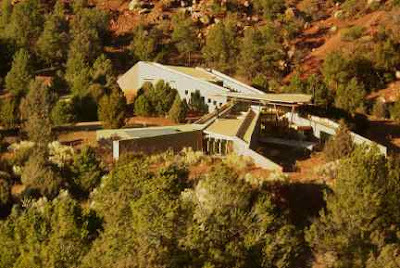 When I saw this house in Apache Canyon near Lamy, New Mexico, from the train last month, my first question was whether the roof was designed to catch water or whether it was just an architect's "concept." And does New Mexico water law let residents catch rainwater? A recent news report on the drought in the Southeast showed Georgians buying rainwater barrels at a garden-supply store. That practice would be technically illegal here in Colorado, where every drop of precipitation is appropriated and over-appropriated. It not only has to flow down its legally adjudicated drainage, but it cannot be delayed! Still, I never have heard of anyone prosecuted for catching rainwater. But I have seen board members of the Southeastern Colorado Water Conservancy District (the "secret government") become testy over someone's plans to build a stock pond or little earthen erosion-control dam when they thought that the permitting process had not been followed correctly. UPDATE: Well, maybe not completely illegal.